Starting today, you can order the new modular storage solution - Storage by Stampin' Up! And it's available for ordering starting today! It is a free-standing system that you design based upon your personal needs. Storage by Stampin’ Up! is designed to store and showcase your Stampin’ Pads, Stampin’ Ink Refills, Stampin’ Blends, Stampin’ Write Markers, Watercolor Pencils, and other accessories. 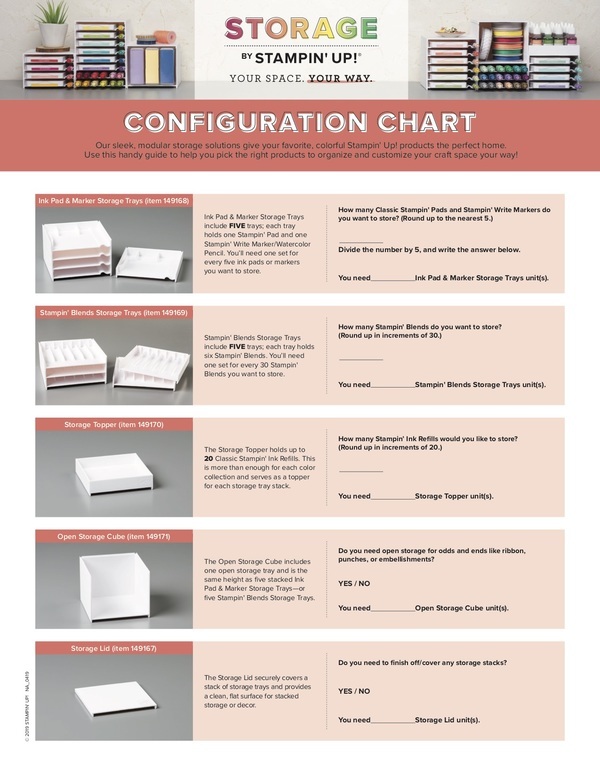 Here is a configuration chart if you want to look at the specific products. Don't worry about them going away any time soon. This system will be featured in the new 2019-2020 Annual Catalog. No order limits apply to the system. If the supply starts to get too low during the initial ordering, Stampin' Up! might turn off the ordering for them, but not to worry. They will be back.